The teenage years are generally the time when kids transition from enjoying the reception of gifts to enjoying the giving of gifts. 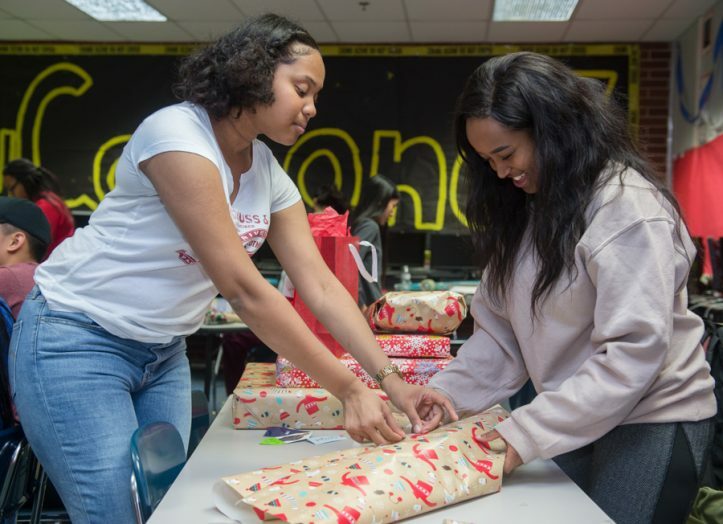 For more than 10 years, the Student Council at Bowie High School has had the pleasure of helping underprivileged families by collecting and delivering Christmas presents for the children in an apartment complex in Central Arlington. Wednesday afternoon, in Room 319 at the school, almost 30 kids happily wrapped the presents, which were given to the families Thursday night. For senior Victoria Baldwin, that part is truly the highlight of the season. Of all the projects the student council does, it’s the one that the kids look forward to most, and the one that provides the most satisfaction. Hobbs says all the projects serve the public well, but this one stands out from all others. One hundred children were adopted this year, and the presents were wrapped and placed in bags. Like Santa Claus, they’re making a list and checking it twice — although Hobbs says it’s probably closer to 50 times. Hobbs and Marc Alcorn, two of the math teachers at Bowie, are in charge of the Student Council, but they needed a student coordinator for the project and appointed senior Nicole Odiase. On Thursday night, the students formed a caravan to deliver the presents to the apartment complex, which Alcorn admits is his favorite part of the project.